Various companies can be found online offering wedding suit hire, and many of these are well worth considering for prospective grooms. There’s a host of benefits to be gained from online wedding suit hire, giving all the more reason to consider it for the special day! Walking into a high-street retailer doesn’t offer the same range of clothing when compared to an online specialist. Suit hire companies operating online will have a massive range of suits covering many styles and sizes, from contemporary to classic, and you can easily view many of these from the comfort of home. Both the bride and groom can view a large number of suit styles online, and then make their decision based on what they like, as well as other factors such as price or availability. Whether you want a suit that is formal, casual, or something totally grandiose, finding something to your liking should be easy enough. 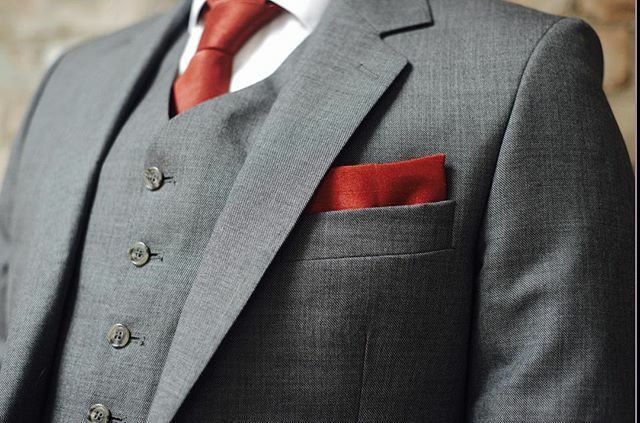 Hiring a wedding suit online is understandably more cost-effective than buying a specially tailored suit. Package deals are always available and offer exceptional value for money when compared to buying the suits outright. Suits are available for under £100 at most websites, so there’s no denying that using an online wedding suit hire can save you a fair amount money – money that can be used elsewhere in the wedding! Plus, buying a suit outright will not only cost more, but it could end up being a total waste of money should you never wear it again! Organising suits for a wedding will never be easy. It involves going to several shops on more than one occasion, which means the groom will have to organise meeting anyone that needs a suit, which can be a nightmare task to achieve. Then there’s picking up the suits, returning any hires, and even going back into the store for alternations if necessary. By doing this all online, you can avoid so much stressful organising and arranging needed for suit hire. You get to view everything from a computer, can order there and then, and will only need measurements from anyone wearing a suit – all of which is quicker and easier than hitting a high-street retailer. Most will have your suits delivered by the needed date, meaning the overall hiring process is just much simpler when done online.